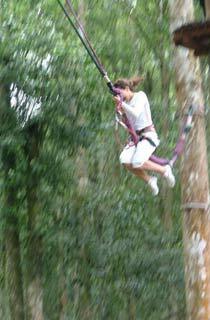 "Tarzan Jump" from the hight trees ! 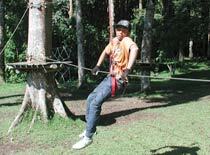 Activity Tree Top at Bali Botanical Garden. 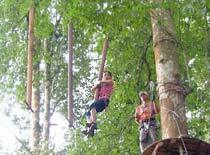 5 Adventure Circuits from one tree to another with height range between 2-20 m. 65 challenges for all level and ages : Suspended bridges, Spider Nets, Tarzan Jumps, Flying-Fox, Flying Swings, and many more. 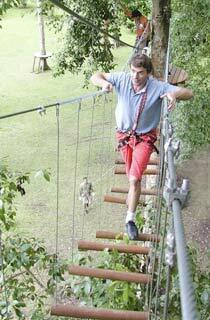 All circuit platforms are held in place using an innovative compression system to protect trees from any damage. * It is rough schedule. The time may before and after depend on the area or traffic situation. We inform the exact time for pick up when you inquire. 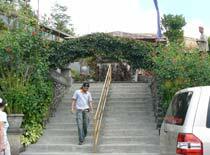 * We can provide private transport depending on booking condition. * All participants must be reasonably fit and healthy with a minumum height of arm raised up of 1m 30cm, at least 4 years old and must weigh less than 120 kg. * Treetop does not include insurance. In case the guest had accident, treetop will sending customer to hospital then paid medical expense. 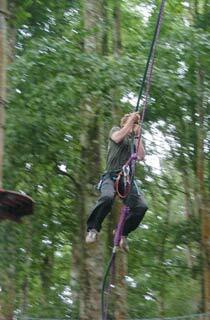 Tree Top is using 2 items; hanging hook and pulley. Professional instructor explains how to use them, and you will try the basic movements in the practice course. 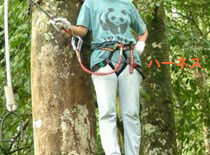 The equipment, harness, hook, and pulley to wear on waist are made in French, great quality for safety. Changing hang 2 hooks when you move. Hang in one, and hang off the other… Don’t hang off both at one time! In case of slipping hands or foot during the course, 2 hooks keep your body like this! Instructor will help you, so it’s no problem. Depend on the level, there are 6 courses. 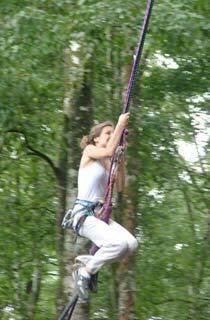 Small kids can enjoy Tree Top, too. This is the famous Tarzan Jump!! 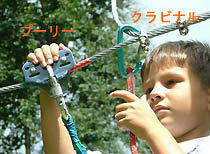 You can try it in Red Course and Black Course. 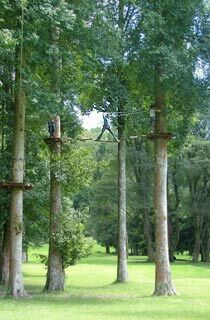 The ground looking down from tree is unexpectedly far… high… But, when you try Tarzan Jump, you will feel good that you never experienced before!! 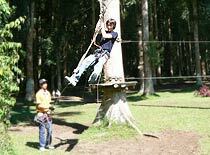 Walking between trees, climbing up Spider Net… Sliding down by pulley, Flying Fox is also popular! It’s really good exercise, so you will use up your energy when you finish playing. For package tour, lunch is included. Moving to Mentari Restaurant for 5 min. by car. Mentari Restaurant is Indonesian food restaurant located beside Danau Bratan. You can eat as much as you want! Almost all menus on this picture. In the package tour, the entrance fee for Ulun Danu Bratan is also included! To the temple, it takes 3 min. from the restaurant. 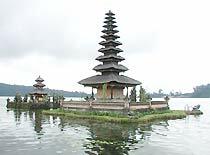 Please enjoy Ulun Danu Bratan, one of the most beautiful temples of Bali. What kind of clothes I should wear? Wear clothes when you go to athletics and trekking. You climb up and down on ladders and Spider Net, so you should wear stretched long pants, T-shirt or long sleeve shirt, and you had better tie your hair. 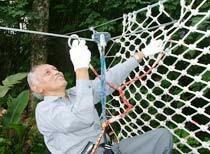 In addition, you walk on the tree while grabbing wire, so sometimes your hands pain. Globes can be purchased in the reception for Rp.20,000. 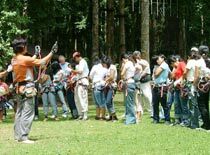 Do instructors climb up the tree together? Usually, they give you advice and check your safety from the ground. If you have some trouble on the way, they climb up tree and support you. Yes, they can speak English fluently. The entrance fee includes the Botanical Gardens, but do I have time to see the garden? 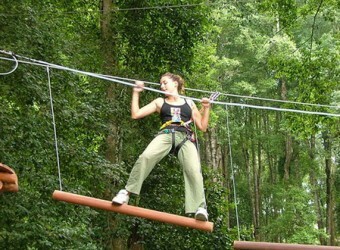 For the package tour, the length of stay in TREE TOP (Botanical Gardens) is 2 hours. During the time, you can walk around the garden. 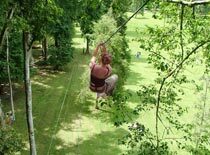 If you apply entrance only and Driver Service, it’s possible to guide in the garden by car after playing TREE TOP attractions. I don’t have confidence with my physical strength, but can I join the tour? 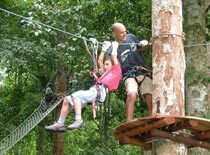 There are 6 courses of different levels, so if you choose the course that suits your physical strength and age, you can enjoy TREE TOP. 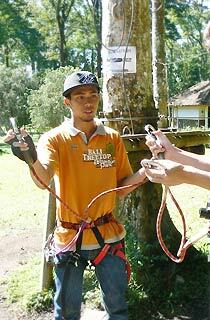 In case of trouble on the tree, instructors will rescue you and lead you to the ground safely. Can you hold Vabue stuff? If it is rain on that day, still held on activity? All participants must be reasonably fit and healthy with a minimum height of arm raised up of 1m30cm, at least 4 years old and must weigh less than 120 kg. 2 courses for children, 4 courses for all aged people. In each course has 8～16 attractions. 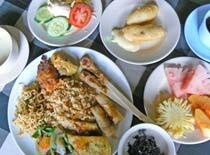 ・In Mentari Restaurant beside Danau Bratan, please have an Indonesian buffet lunch. They serve about 10 kinds of dishes, soup, fruit, desert, coffee & tea. Casual clothes, sport shoes (sport sandal), sun lotion, etc. If you have globes, you are recommended to bring them. Athletics played in childhood. That brings back my memories. But now I am an adult I cannot move my body quite as expected. Lunch was pretty good. It was fun.